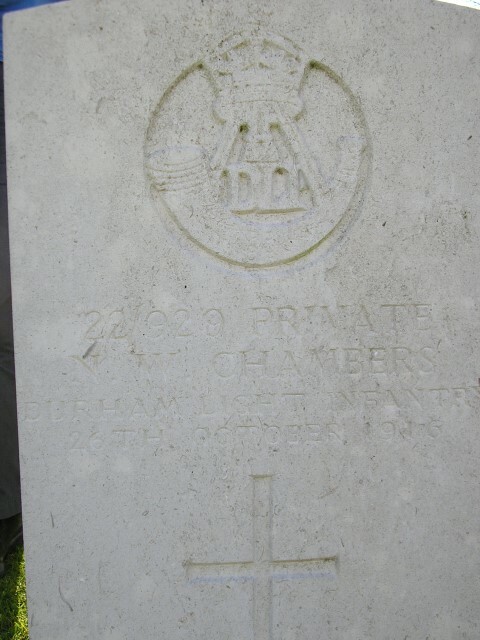 22/929 Private Norman Wilson Chambers, 22nd Battalion, Durham Light Infantry died of wounds 26 October 1916 and is buried at Grove Town Cemetery, Meaulte, France. He was 27 years old and is commemorated on the Cockfield War Memorial and the Roll of Honour, Cockfield Council School. The family lived at 25 Dockwray Square, North Shields and his father Robert worked as a river pilot. Robert died 5 January 1899  and by 1901, Norman’s older brothers John and Robert both worked as clerks (house agent) and Alfred was an apprentice ironmonger. By 1911, 21 year old Norman was lodging with Sarah Hall, 13 Mount Pleasant, Cockfield and was employed by Durham County Council as an elementary school teacher. 1 June 1916, Norman married Maria Mary Walker at St. Mary’s Church, Cockfield and they lived at Barnard House, Cockfield. Norman Wilson Chambers enlisted 8 December 1915 aged 26 years 4 months. He underwent a medical examination 12 February 1916 – he was 5ft.8½” tall and weighed 126 lbs. and found to be “Fit for general service.”  He joined the 22nd Service Battalion, Durham Light Infantry (Pioneers). The 22nd Service Battalion, Durham Light Infantry was formed at Hartlepool in October 1915 and landed at Le Havre, France in June 1916 and was attached to the 19th (Western) Division then was transferred to the 8th Division in July 1916. Private N.W. Chambers was placed on the Army Reserve 8 December 1915 and posted to 22/DLI (B Company)  11 February 1916. He entered France 17 June 1916. October 1916 and 22/DLI was ordered back to the Somme, repairing roads. Then orders came that the 8th Division would attack German trenches at Le Transloy, 23 October 1916. A Company was to work as stretcher bearers and heavy casualties were expected. B Company was involved from 22 to 25 October, digging assembly trenches and 23 October commenced digging a communication trench. Whilst doing so a heavy enemy bombardment lasting 2½ hours resulted in about 10 casualties. The assault was to be renewed 0350 next morning 24 October and a party of men from B Company went over the top with the second wave to dig a trench on the right of the sector. At 07.00 orders were received to withdraw and B Company was ordered out of the line. C Company went over the top at 1930 hours 22 October and was subject to a heavy barrage, 5 men were killed and 14 wounded. D Company left their billets 1630, 23 October but their guide got lost and their action seems to have fraught with problems. Between 22 and 27 October 22/DLI lost 2 officers and 26 other ranks killed in action or died of wounds including Private N.W. Chambers. 1 officer and 21 ORs were killed 23 October 1916. Private N.W. Chambers served with B Company and was wounded 23 October 1916. He was treated at No. 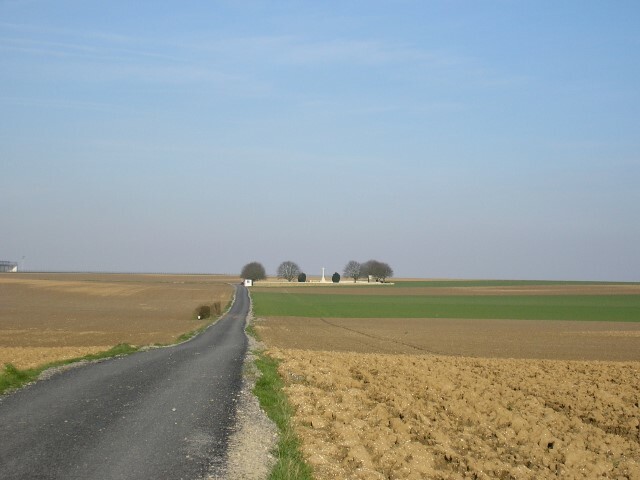 34 Casualty Clearing Station where he died of his wounds 26 October 1916. He suffered GSW (gunshot wound) to the skull, compound fracture. 22/929 Private N.W. Chambers is buried at I.P.47 grave reference, Grove Town Cemetery, Meaulte. “Durham Pals: 18th, 19th & 22nd Battalions of the Durham Light Infantry in the Great War” J. Sheen 2007 p.111-114 – casualties see p.113 a quote from Major Davidson but Miles p.53 quotes “5 men had been wounded”.